Ease up with the fossils Jimmy ! I was at that game. Pity they didn't put Winter on him in the GF. Glenelgs caretaker coach did a pretty good job on Rick that day. Location: Wherever Sturt are playing. I remember that day vividly. I was there with a mate of mine from Melbourne. He said, "This Davies fella is all right". He'd never heard of him, and this was after Rick came back from Hawthorn. Poor Davies had a complete shocker that day, probally the worse game he had of his career. The Jumbo was magnificent that day against west, I remember Neil Craig feeding him too. The Blues didnt stuff around with handball that year because Rick Davies as their full forward was the complete package. Jim Derrington, Paul Hollis, Michael Graham, Chris Radbone, Ray Wilson, Frank Spiel, Eddie Fry, Tim Peach, Andrew Downes and the Champ Peter Motley, John Paynter, Phil Hienrich, Greg Whittlesea etc etc etc etc we had a magnificent side, but the truth was west were just a tad better over the course of the year. I was at this game at Football Park in May 1983 as a 13yo, I remember it vividly. My mother's uncle was born and bred in rugby country, NSW, but he was an exceptionally enthusiastic sports fan who, on visit to SA, relished the opportunity to take me to West Lakes to witness the best that Adelaide had to offer in the "off season" from cricket. From memory, at 1/4 time, it was Sturt 9 goals 4 behinds. 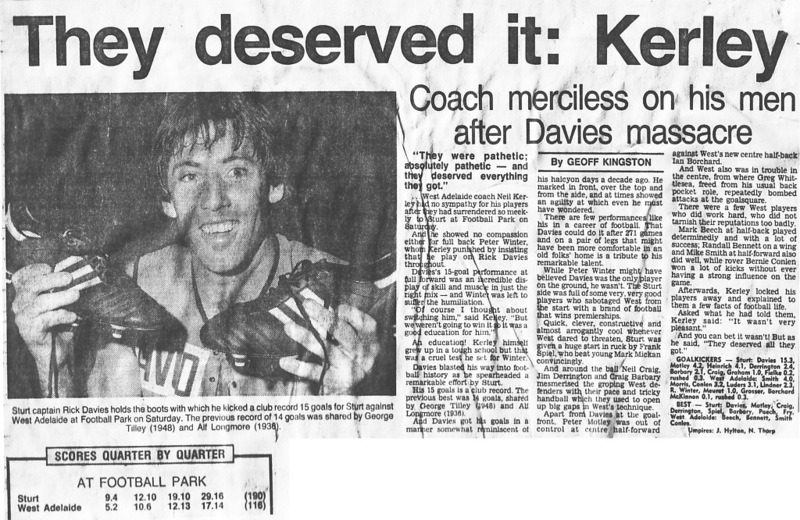 I remember Davies kicking 10 and the crowd cheering, and a massive crowd reaction to each of the following goals. What I could not understand as a 13yo was how peter meuret could kick Michael Graham in the balls near the end of the minor round and get away with it as westies won by 2pts and how all 5000 westies supporters came out of the woodwork to see Sturt have their biggest losing margin in a GF of 35pts inflicted to that point in time.